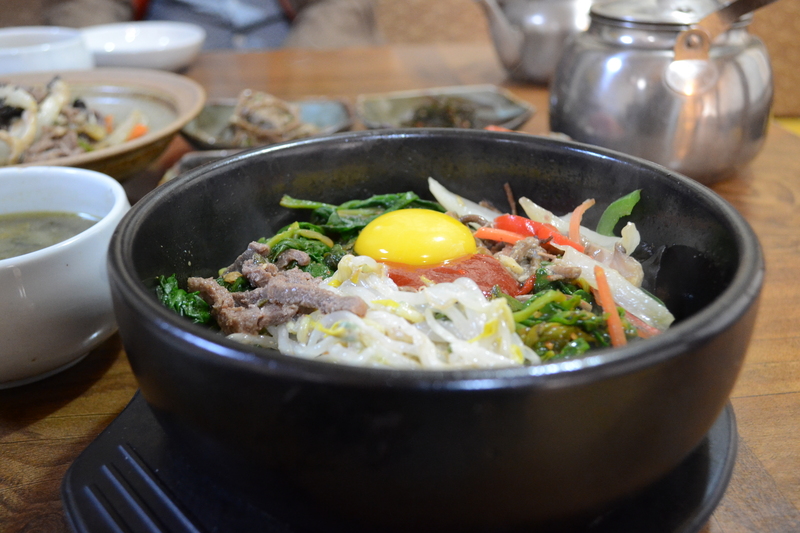 A hot stone pot bibimbap. Quite possibly the best thing you can eat on a cold day. When we were deciding our route for this trip, we hadn’t initially planned for a stop in Korea. We were actually hoping to make our way over to Japan after China, but, short on allowable miles for our ‘Around-the-World’ ticket and short on time, we took a look at the map and both agreed on Seoul. Neither of us had been there before and I know that secretly Rahim wanted to re-enact Psy’s dance in Gagnam. So, a few days ago, we landed in Incheon airport and began our adventure in this city of bibimbap, technology, and 24-hour cafes. While we encountered and enjoyed the expected – I’m speaking of Korean BBQ and 4D movie theaters of course – we also learned quite a few new things in this city that I was wowed by. The absolute ‘coolest’ of these was the concept of Ondol, or the traditional Korean heating system. Ondol is basically a way of floor heating. The source of heat was traditionally a fireplace that was placed either in the kitchen or on the outside of the house. Houses were built in such a way that there were hollow passageways underneath the mud and stone flooring. The heat and smoke from the fireplaces would pass through the passageways and heat up the stone above it, effectively heating the flooring and the room. The smoke would eventually come out through chimneys connected on the other side of the passageways. I was told that a fire of a few hours could keep a home heated for the entire evening! We were repeatedly told that in Korea it is customary to sit, eat, and sleep on the floor. Nobody really explained why that was though, but after understanding how homes were heated, it makes complete sense that you’d want to spend your time as close to the heat as possible! 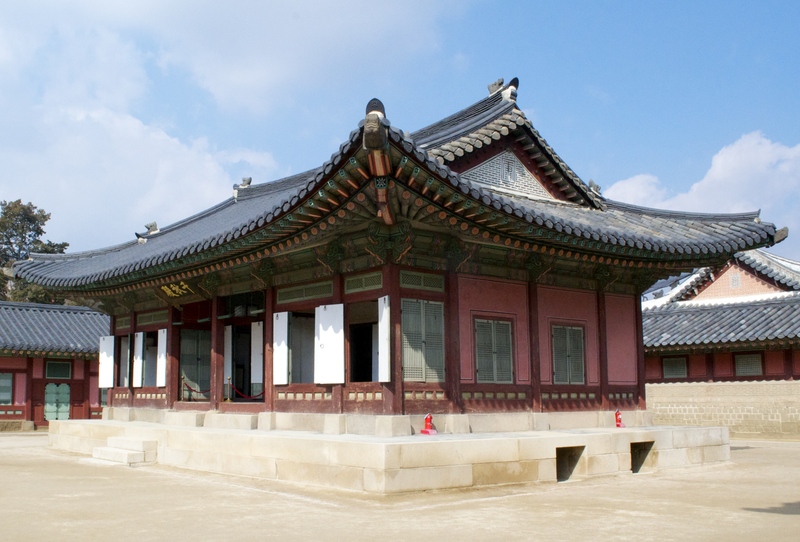 The King’s Office building at Gyeongbokgung Palace. 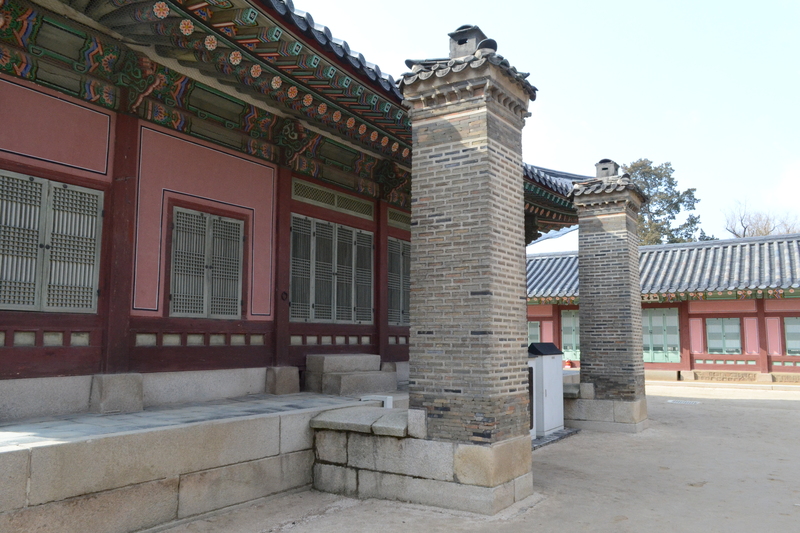 The openings on the side of the building are the fireplaces that were used for ondol heating. These are the chimneys at the back of the building where smoke could escape from after having heated the flooring in the building. Today, most homes do not use the traditional ondol, but use a radiant heat ondol, meaning that heat is transferred through hot water pipes underneath the floor. Rahim and I had a chance to try this out at the guesthouse we were staying at and let me tell you – it works! 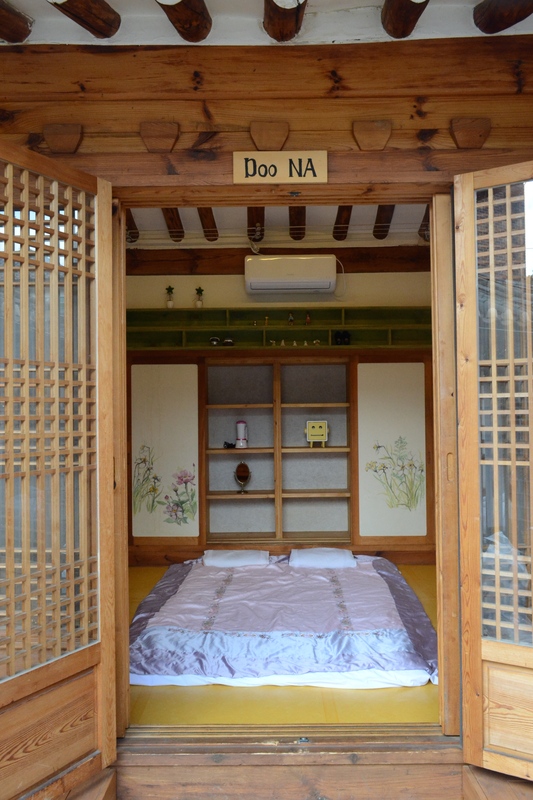 Our guesthouse – Doo Guesthouse – was a traditional Hanok (or traditional Korean-style home) where our bedroom door was basically a sliding door opening out into an open courtyard. Our room – no furniture, just the floor mattress! When we first arrived at our room, our host opened up the doors to put our bags in and then left them open as he was welcoming us and orienting us to the neighbourhood. I almost couldn’t concentrate on anything he was saying because I was standing outside in the freezing cold and staring into the room with the doors completely wide open and no heater in sight! On top of that, there was a simple mattress for the floor and one blanket. I thought for sure we were going to freeze during the night. Rahim must have been as consumed by these thoughts as I was since I heard him quickly ask about the heating as soon as our host had finished speaking! Our host pointed to the floor and said that we’d be fine. Feeling cozy in our Hanok. He absolutely wasn’t lying. The floor heating was so incredible that we almost felt too warm! In fact, we could leave the doors open into the courtyard with -5 Celsius weather and still be comfortable inside the room. It was also pretty amazing to come home at night and put on pjs that had been warmed up by the floor (we left them on top of the mattress over the heat spots) and leave in the morning with warm socks! Now if only they can figure out how to do this in Europe! Doo Guesthouse – The courtyard surrounded by bedrooms, a kitchen, lounge, and bathroom. Our room was Doo Na, the one on the left side of the picture. Next Post We Are Off Again!